The role of Corporate Magician encompasses a huge variety of roles, venues, situations and requirements and I've chosen to specialise in corporate magician work because it is both very demanding and very rewarding. The main challenge as a corporate magician is the constant development and delivery of new and original ideas and effects, to keep the magic fresh and compelling. Great new ideas and tricks allow me to continually baffle, bewilder and entertain many, many people. "We all had an absolute blast yesterday and you were the talk of the evening and now all I’ve heard this morning is “he was amazing, how did he do that?” – so thank you for making the event extra special." I'm very proud of my reputation as one of the UK’s leading corporate magicians, a reputation I have successfully built over many years. The absolute highlight of my career so far was in the Summer of 2006 when I had the honour of performing at Buckingham Palace for the Queens 80th birthday celebrations. "David was really professional. We had many overseas customers there, as well as members of our trade press, and everyone was delighted with his act - each table gave him applause as he went round to them. I found the magic amazing - he's very skilful! I'd definitely recommend him!." Trying to impress a new client? Looking to entertain an existing client or to impress an overseas one? Hoping to gain the approval of a potential investor? Just wanting a relaxing time after a long seminar? Whatever your hospitality plans, why not include a touch of intimate, very special magical entertainment? Very often, I'm asked to perform as a table magician, enthralling guests (between courses if that suits you best) with a subtle blend of humour and close up magic. Over the years, I've undertaken corporate entertainment for many of the UK's largest blue chip companies – performing magic in so many different environments, ranging from a handful of guests seated at a private dining table to being in front of thousands of guests at a banquet in the Grand Hall at the Dorchester Hotel in Park Lane, London. If you'd like to discuss your requirements, please do get in touch. I promise you and your clients an unforgettable evening. If you're launching a new product and you're looking for something completely different, why not try a bit of magic? A magician's skills are always guaranteed to gather a crowd – whether that be around your product, outside your shop or at your trade show. It also works remarkably well by providing a subtle, 'ambient' entertainment around your showroom for a new launch. I've used my magician's skills in this way for companies such as O2, Audi, Land Rover, The Mall of the Emirates - Dubai, Alliance & Leicester, British Home Stores, Burton Menswear, Sainsbury's, Canary Wharf Shopping Centre and many more. I would definitely recommend Dave to any function you have!" Staff Christmas Party? Annual Award Ceremony? Summer Ball? …but why not 'break the mould' and surprise everyone with a really special and very different evening? That's exactly what will happen with my close up magic show. Your staff or guests will remember and talk about the event for months afterwards. I'll mix and mingle with your guests during the reception drinks, breaking the ice and setting the mood for the evening. There are always plenty of 'wows' and laughter. Then, between courses at dinner, I'll visit each table and perform a 'personal' close up magic show, using sleight of hand, very clever pick-pocketing and some Derron Brown style mind reading. "We just wanted to say a huge thank you for your performance at our charity ball on Saturday. All of our guests have commented on how brilliant you were and I can assure you, you were the sole topic of conversation at the breakfast tables in the hotel on Sunday morning!" Making sure your company day is one to remember can be beneficial in so many ways, whether to impress clients, visitors or staff family members. Whatever the location - grounds, office, shop floor or warehouse, my skills as a wandering or strolling magician will come in to play. I will mix and mingle effortlessly with your guests, delighting and entertaining them wherever they are. 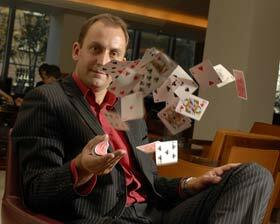 I've performed magic at airport lounge openings, performed on shop floors, toured call centres and even performed in the cramped conditions of a Royal Navy ship's engine room! 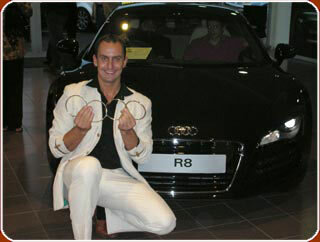 I can even build your "corporate message" into the performance, or introduce your products as part of the magic show. As with any good magic show, audience participation is the key to a spectacular performance and this was certainly the case at Bohle's latest customer open day, seeing the company conjure up another array of exciting activities and demonstrations to mesmerize even the most sceptical of minds. 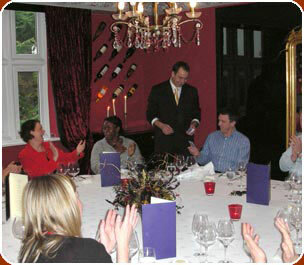 "Many thanks again for a superb evening of magic – I know you wowed a load of people and I’m extremely grateful. My boss declared the evening a great success so many thanks for your part in making that happen." Need more than one Corporate Magician? Some events are so big, they exceed the capacity of one magician on his own! I'm asked regularly to perform at very large corporate events and I have built up an impressive list of fellow magicians, all of outstanding ability, whom I can call upon. It means I can provide entertainment for up to 1,000 guests. 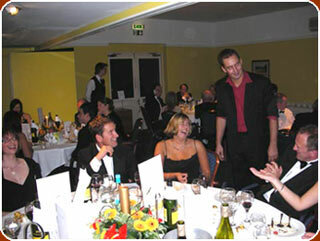 Generally speaking, one magician can entertain around 10 tables or 100 guests in about 2-3 hours. "I just wanted to say a huge thank you for your amazing entertainment on Saturday night... every single person there said how much they enjoyed it (a few of them couldn't talk on Sunday morning because they were still laughing so much! ), and I know you will be a talking point for ages!" 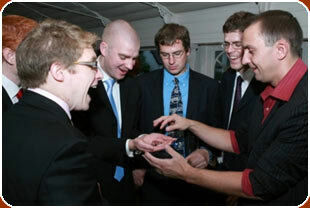 Magicians are earning rave reviews from businesses planning the perfect corporate event. John Hill meets a few who've wowed the crowds in the Wharf. I MET two people in hotel bars recently. The first one stole my ring, and the second bent a fork and made my five pound note disappear. Most of the time, that's a sign that you're drinking with the wrong crowd. But these guys are in demand with multi-billon pound companies from Canary Wharf to Dubai. 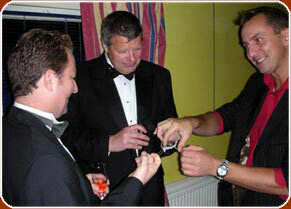 David Bonsall and Jamie Raven are professional magicians. While most of their fellow craftsmen might see this kind of gig as a hobby, they're pulling in enough bookings to pay the bills. And an increasing number of them are coming from businesses looking for the ideal entertainment for clients or parties. So thankfully they can afford to give back the jewellery when they make it vanish. David became an full-time magician five years ago after a spell in the Royal Marines. The south coast performer was once an Olympic hopeful for Scotland in the decathlon, but injury lured him towards the art of illusion. He said: "I started magic at 10, and was performing part time at the age of 17. I had a back injury and the only thing I really knew was magic, so I thought I'd give it a go. "It's definitely a business. It's not just a hobby you can make money out of. You really have to market yourself. Most professional magicians spend about 90 per cent of our time finding the work, and communicating on the phone and the computer. You need the discipline to get up at 8am and spend all day working, because it's easy to turn on the TV or go out with friends. "It's almost like the magic is a part-time thing, because you spend so much time getting the work in." David met me at the Marriott's Manhattan bar in West India Quay on the way to a booking in Surrey, but he's wowed crowds at Wharf-based bank Barclays, Canada Place mall and The O2 arena. He's noticed a steady rise in corporate bookings in recent years. He said: "It's a different environment. I find people at corporate gigs are much more relaxed, and don't spend their entire time trying to catch you out. "Five or six years ago corporate events made up about five to 10 per cent of work. Now it's about 60 per cent. "People are realising the potential of magic as an ice-breaking tool, getting the guests in the right frame of mind and impressing the clients. "I'm very much a mix and mingle magician. You've got to be a people person for that. I spend a lot of time reading books on body language and the art of conversation. Some people can be very intimidating, and when you interrupt a group of people networking you've got to be their best friend within about two minutes." ....to read the full article, click here.